WHY SHOULD I CLEAN MY SYSTEM? Performing stand-alone cleaning cycles on your?card printer on a regular basis helps ensure that your printer?is operating at its highest level. Without regular cleaning, your cards may be printed with visible defects, and you may?experience premature printhead failure, which is an unnecessary and costly expense. products help to reduce contaminants in the system that can be transferred to the card and protects the system from?printhead failure. Regular cleaning is necessary to extend printhead life and ensure high quality cards. WHEN SHOULD I CLEAN MY SYSTEM? For a color ribbon, the best time to perform a cleaning cycle is when the ribbon is being replaced. Cleaning the printer at?this time eliminates printer downtime. This means that every ribbon replacement will result in one cleaning cycle. All color?ribbons come with a cleaning card and new roller. For a monochrome ribbon, we recommend that you schedule cleaning between ribbon replacements. Monochrome?ribbons require more frequent cleaning because their high yield means that they tend to remain in the printer longer. ?Additionally, their material composition tends to produce more contamination within the printer than color ribbons. All?monochrome ribbons come with a cleaning card and new roller. Occasional debris built up on the printhead can lead to card quality issues, such as white lines appearing on finished?cards. If not cleaned, the printhead will eventually fail. We?offer isopropanol cleaning swabs specifically?designed to clean the printhead. Cleaning the printhead is also a good opportunity to perform a cleaning cycle (refer to?cleaning cycle instructions below) and remove all contaminants from the print rollers. WHAT DO I NEED TO CLEAN MY SYSTEM? 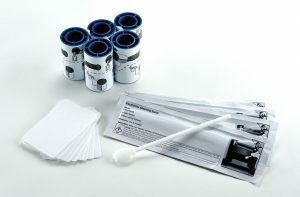 You typically a cleaning kit, swabs or spare parts, depending on the printer. Contact us for more info. HOW SHOULD I CLEAN MY SYSTEM? 1. Replace the cleaning sleeve or cleaning tape (depending on the Datacard card printer). 2. Run a printer cleaning card. 3. If printing duplex cards or using laminate material, run a duplex cleaning card. Note: Remember to keep the spindle of the cleaning roller, as it is intended to be reused. If you accidentally?discard the core, a replacement can be ordered. Please see above for the appropriate part number. CardsOnline Singapore is a website by All ID Asia, a company principally involved in providing innovative and comprehensive Automatic Identification and Data Collection (AIDC) solutions to various industries. Subscribe to our newsletter to get the latest updates on our products & promotions.